Our customized assessments are used by thousands of public and private companies, hundreds of universities and government organizations on a daily basis. communications, productivity, and value growth. Our most popular comprehensive assessment can be used as a self-optimization (21-page report) or a 360 multi-rater assessment (41-page report). 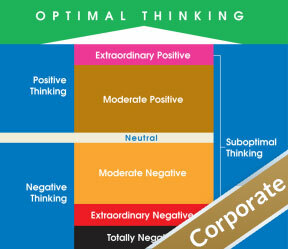 If you are ready to be your best, maximize your resources and opportunities, interact optimally with others in any situation, and much more, the Optimal Thinking Online Assessment is an essential, invaluable tool. The assessment optimizes all training, continuing education, coaching, consulting, and development programs. This program is ideal for business owners, human resource professionals, in-house trainers and divisional managers in the corporate, education and government sectors. If you would like to rate your leadership skills, take this 25-question confidential leadership skills assessment online. Developed over 26 years, the assessment pinpoints your strengths and weaknesses. It will help you understand the difference between where you are and where you most want to be. Over 450,000 leaders, including Fortune 500 executives, politicians, military leaders, and graduate students have taken this leader assessment. Take this 25-question confidential Communication Skills Assessment to rate your communication skills. Over 510,000 people around the globe ranging from Fortune 500 executives, politicians, military leaders, and graduate students have already taken this communication skills assessment. Take this 25-question confidential Time Management Skills Assessment to rate your time management skills. Over 385,000 people ranging from Fortune 500 executives, politicians, military leaders, and graduate students have already taken this assessment to discover how well they use their time. Successful executives, business owners, and people with fulfilling lives often speak about how coaching has been instrumental in catapulting their careers and personal success. This 15-statement quiz will help you to determine if you are coachable and if coaching is for you. Take this 25-question confidential Business Maturity Assessment to rate your business. It was developed over 25 years and will quickly pinpoint your business’s strengths and weaknesses and help you understand the difference between where you are and where you need to be. Business Plan Writing Service Assessment. Many businesses lack a viable custom business plan to best guide their success. During the past 27 years, we have learned when a premier business plan service is truly in a company’s best interests. This 12-question quiz will help you determine whether such a business plan service is for you. Business Processes and Product/Service Design Assessment. This 25-question assessment will help you to rate your company’s maturity in process improvement and product/service design. You will learn where your company stands in relation to where it needs to be. Innovation in Your Organization Assessment. This 25-statement innovation quiz is free and is scored online. Examine how well your organization generates and supports innovation. This 25-statement sales territory assessment is free and will help you identify the effectiveness of your sales territory management and market potential. Emotions are invaluable allies that serve as our inner compass. Disturbing emotions are optimization signals. They alert us that our thinking or actions may not be in our best interest. Used by over 2000 companies and 110,000 individuals, this 25-statement quiz enables you to define the emotional intelligence of individuals, teams, departments and entire organizations. Your assessment was easy and quick to complete. I cannot think of any dislikes. Callaway Partners Practice of Huron Consulting Group, Inc. I enjoyed the insight in to how my thinking style interacts with others. I felt the description of the interaction was accurate. The discussion of "how to" connect with other "thinking types" will be helpful with my relationships with others, both at work and in my personal life. The assessment itself is very comprehensive. I also like that it is in pdf format and not just html so I can save it and read it while not on the internet. Life Science Information Technology Global Institute. Forces you to think outside the box of the Myers Briggs or similar tools. Also shows you more of a rounded look at who you are and how you think than other assessments. This analysis provides a sound method for gaining insight into how your thinking and actions are perceived by others unlike other ways such information can be obtained. It provides a good understanding of how to recognize your own style and enables you to consider how to improve. Lenny Bart, Exec.V.P. Administration, Warner Bros.